Low-cost airline EasyJet flies from London and other UK airports to Christmas markets in Berlin, Munich, Hamburg, Dortmund, Stuttgart and Friedrichshafen. British travelers can enjoy cheap flights on easyJet when traveling to Christmas markets in many German cities. Visiting a German Weihnachtsmarkt has long been popular with British travelers but is now easier and cheaper for many fortunate to live close to an airport served by low-cost airlines. EasyJet has flights to Berlin, Munich, Hamburg, Dortmund, Stuttgart and Friedrichshafen. Some of these cities have the best Christmas markets in Germany. Ryanair also flies to German Christmas markets from many British and Irish airports. Taxi2Airport gives online quotations for private airport transfers in Germany without first requiring personal details or flight numbers. However, many travelers will save more by using public transportation. Berlin is by far the most interesting city to visit in Germany and has the largest number of Christmas markets too. 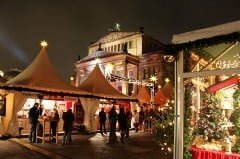 Several large Christmas markets are in the center of Berlin ensuring visitors plenty of opportunities to enjoy Glühwein and other Weihnachtsmarkt specialties. Berlin has plenty more to see and also has the longest shopping hours in Germany. Christmas markets in Berlin are often open on December 25 and a few days after Christmas – a tourist friendly approach that other German cities are still slow to follow. EasyJet flies to both Berlin-Tegel Airport (TXL) and Berlin-Schönefeld Airport (SXF). Schönefeld Airport to the south of Berlin is the traditional arrival airport of budget airlines – Tegel Airport to the west of the city is closer to the center and with slightly cheaper and faster transportation options. EasyJet flies to both Berlin-Tegel Airport (TXL) and Berlin-Schönefeld Airport (SXF) from London-Luton (LTN), London-Gatwick (LGW), Manchester (MAN) and Edinburgh (EDI). EasyJet also flies to Berlin-Schönefeld Airport (SXF) from Liverpool (LPL), Manchester (MAN), Glasgow (GLA), Newcastle (NCL) and Bristol (BRS). Transportation from Berlin-Schönefeld Airport is cheapest by train while the bus is the easiest option from Berlin-Tegel Airport (TXL). EasyJet has cheap flights to Munich Airport (MUC) from London-Stansted (STN), London-Gatwick (LGW), London-Luton (LTN), Edinburgh (EDI), and Manchester Airport (MAN). Munich (München) is a great city to visit and has a fine Christmas market in the old town too. 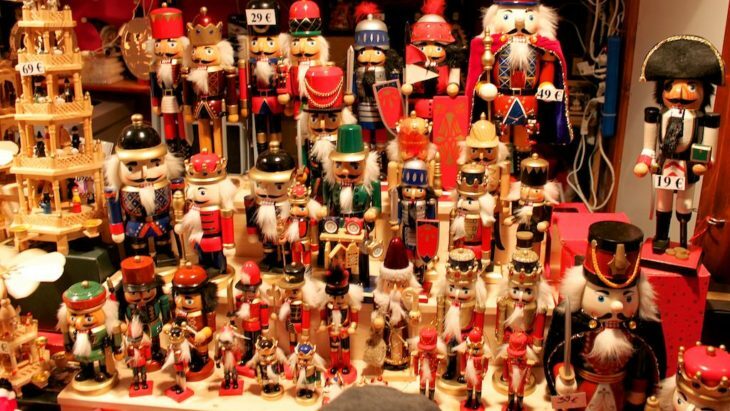 However, nearby Nuremberg (Nürnberg) has arguably the most famous Christmas market in the world. Transportation to Nürnberg is easy from Munich Airport (MUC) and Munich Hauptbahnhof main train station. Ryanair flies to Nuremberg from London-Standsted and Manchester. British Airways usually have Christmas market seasonal flights from Gatwick. Dortmund Airport (DTM) is tiny and very convenient with cheap bus transportation to downtown Dortmund. EasyJet flies to Dortmund Airport (DTM) from London-Luton (LTN). Hamburg is the second largest city in Germany and probably most famous for its harbor and nightlife. Like any other German city, Hamburg has Christmas markets but these are rather less famous than those in other cities. Lübeck is also a beautiful city to visit with many brick Gothic buildings confirming that this city was the queen of the Hanseatic League. EasyJet flies to Hamburg Airport (HAM) from London-Gatwick (LGW), Manchester Airport (MAN) and Edinburgh (EDI). Stuttgart is not particularly famous for its Christmas market but like any other German city has a Weihnachtsmarkt during advent. Stuttgart is home to the Mercedes Benz museum and Porsche museum and thus a natural choice for any motoring fan keen to see these major car museums while visiting a German Christmas market. Metzingen near Stuttgart is famous for its outlet shops with five Huge Boss factory outlets. Friedrichshafen on Lake Constance (Bodensee) has a small airport that is mostly used for international flights to the nearby ski resorts in Southern Germany, Switzerland, Austria and Liechtenstein. EasyJet flies to Friedrichshafen Airport (FDH) on weekends from London-Gatwick (LGW). Great bargain deals are often available during the Christmas market season before the skiers arrive. Ryanair also has cheap flights from Britain and Ireland to various cities in Germany. See Cheap Ryanair to German Christmas markets for more details. Good deals are often available on Lufthansa flights too especially if booking well ahead and traveling during quiet periods.